This last week last been been stressful and I’ve yet something else vision-wise to adjust to. Last Sunday I noticed mistiness, pain and weeping in my right eye. Having had similar symptoms when the 25 year old corneal graft in my left eye began to reject and I needed a partial re-graft in May last year, I feared the same thing was happening again, but this time in my right eye, which had originally been grafted 22 years ago. Researchers into aniridic keratopathy held a event so they could meet people affected by the condition so they could learn about each other. Corneal opacification affects people with aniridia because of deficiencies in the eye’s limbal stem cells. The Cells for Sight Transplantation and Research team at University College London (UCL) is working to understanding it and develop treatments. 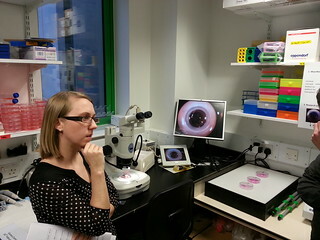 The Cornea Connect meeting on 14 February 2014 was the first of its kind at the UCL Institute of Ophthalmology which is attached to Moorfields Eye Hospital. It aimed to bring together scientists and patients with a common interest in the cornea and to talk about the challenges faced by both parties.